The EU and the US still refuse to see a direct connection between the ideology of Islamism and its military Daesh and al-Qaeda wings; neither the US, nor the EU has taken serious steps to prevent new Paris/San Bernardino-style attacks, Ghassan Kadi, The Vineyard of The Saker's columnist and expert on Middle Eastern affairs, told Sputnik. A de-classified US Defense Intelligence Agency's 2012 document stated clearly that the Syrian uprising of 2011 was orchestrated by the Muslim Brotherhood (MB), the Salafists and al-Qaeda in Iraq. It is not the first time when the Muslim Brotherhood has taken part in a regime change attempt: after the Egyptian revolution of January 2011 the Muslim Brothers had even come to power in Egypt. "It's hard to give this question enough justice because it encompasses a multitude of areas and topics. Mubarak had been in power for over three decades and there was a huge level of dissatisfaction with his presidency at most levels of society; and not with the MB's alone. The secular youth, known then as the '25th of January movement' played the most substantial role in the initial revolt, and at that time, the MB's were nowhere to be seen. I continue to believe that up till that point in time, the revolt in Egypt was a genuine popular uprising. All of a sudden the MB's came in at a later stage and capitalized on an existing unrest and hijacked it to their advantage. They were organized, and they had been preparing for such an opportunity for decades," Ghassan Kadi, Syrian political analyst and expert on Middle Eastern affairs told Sputnik. "The precedent that was created in Egypt became later on known as the 'Arab Spring' with the intention of using Islamists to destroy Syria," Kadi continued. "The battle for the hearts and minds of Arab youth in general, and Muslim youth in specific, was first launched between the then secular pro-Soviet Egyptian President Nasser and the Islamist pro-American Saudi King Faisal," the Syrian expert emphasized. Up until 1967 Nasser was extremely popular and Islamist ideology had no chance at all. However, Egypt's defeat in the 1967 June war with Israel was detrimental for Nasser's popularity. Kadi pointed out that it was the time when Islamists came onto stage promising a "new direction" to restore the Levant's "former glory." "The rise of the economic power of Saudi Arabia facilitated that process, and the West was very happy to see Arab/Muslim youth diverting away from Communism, until they realized that they can in fact be brethren in arms fighting together against the 'Infidel' Soviets in Afghanistan," the Syrian expert narrated. "In the 1930s, and for fairness to al-Banna, no one in the Arab and Muslim worlds cared much about finding out about the true nature of Fascism. Hitler presented himself via Nazi propaganda to Arabs as a liberator and an enemy of the traditional British and French usurpers and colonialists. After all, propaganda was running high and the introduction of the radio at that time made it easy for different parties to put their messages across, and there was an Arabic radio station transmitting from Berlin to the Arab World. By then, Arabs had all the reasons not to believe anything the allies told them, after all, it was France and Britain who lied to the Arabs and did not grant them independence as they promised that they would be provided when they joined the fight against the Ottoman Turks," Kadi elaborated in the interview with Sputnik. 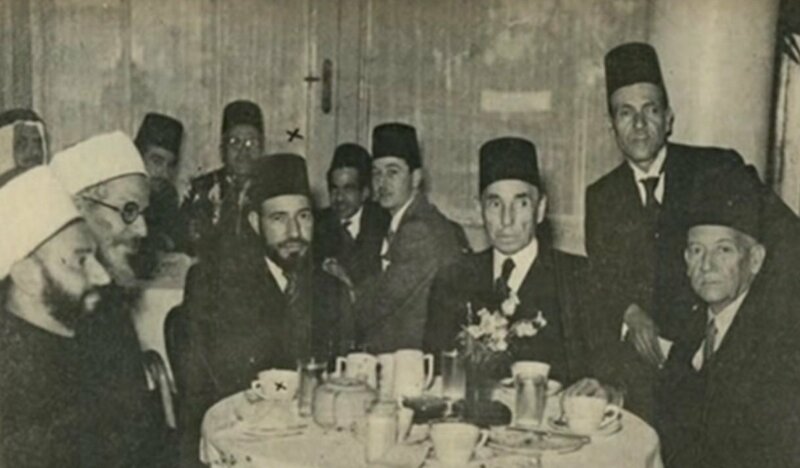 Al-Banna (third from left) with Aziz Ali al-Misri (fourth from right) and Egyptian, Palestinian and Algerian political and religious figures at a reception in Cairo, 1947. Hitler's Nazi Germany had not been the only dubious ally of the Muslim Brotherhood. The transnational organization has certain ties with the infamous al-Qaeda terrorist organization. Experts note that the teaching of Sayyid Qutb, the Brotherhood's leading member and the so-called father of modern Islamist fundamentalism had had an influence on Osama Bin Laden. After Sayyid Qutb was executed in Egypt in 1966, his brother and follower Muhammad, fled to Saudi Arabia and taught as a professor of Islamic Studies at Jeddah's King Abdel-Aziz University. Reportedly, Osama bin Laden was one of his "star" students. Khalid Sheikh Mohammed, one of the architects of 9/11 terrorist attacks was also believed to be one of the Brotherhood's "pupils." Do al-Qaeda and the Muslim Brotherhood's ideologies have much in common? "The ideologies of the MB's and Al-Qaeda are identical. In this same basket, you can include the Wahhabis, the Salafis, and all other Islamist groups. And even though the Egyptian MB's did not have a history of violence like their say Syrian counterparts, members walk in and out of these organizations all the time, and in effect, there is no difference between them at all. After all, Ayman Zawahiri himself, the current leader of al-Qaeda, is a former Egyptian MB member," Kadi emphasized. "All of those organizations are based on a distorted form of Islam that believes in coercion and enforcing the rule of Sharia over the entire globe. They may hate one another at times, they may fight over loots and political alliances to different sponsors, but ideologically-speaking, they are identical, although disagreeing at times on very insignificant theological and practice issues," the Syrian expert explained. Why are European and American policymakers still in denial and refuse to recognize the threat posed by Islamists' ideology? The Muslim Brotherhood has not yet been designated as a terrorist organization by the US and the EU. Many Muslim Brothers are working in European reputable foundations and lecturing in Europe's numerous Mosques. Interestingly enough, back in 2007 America's influential Council of Foreign Relations' media outlet argued that the Muslim Brotherhood — "the world's oldest, largest, and most influential Islamist organization" — had rejected global jihad and embraced "democracy." "In the anxious and often fruitless search for Muslim moderates, policymakers should recognize that the Muslim Brotherhood presents a notable opportunity," Robert S. Leiken and Steven Brooke wrote in their article entitled "The Moderate Muslim Brotherhood" for Foreign Affairs. Ayman al-Zawahri, left, holds a press conference with Osama bin Laden in Khost, Afghanistan in 1998. "The EU and the US are either refusing to see the ideological link between the religious wing (i.e. the MB's) and military wing (i.e. the terrorists), or they are trying to distance themselves from the terrorist organizations in the hope to use the MB's in the future," Kadi told Sputnik. "However, the EU and the US do not see further than their noses and they have proven this time after time. For them to even imagine that they can have another go at harnessing Islamic fundamentalism is a proof of their short-sightedness and lack of ability to learn from previous mistakes," he added. "Is America foolish enough to forget 9/11, and not clever enough to understand the underlying foundations needed to launch an attack like the San Bernardino attack?" the Syrian expert asked. "I cannot see that the West has planned its interactions and the outcome of its support of different Islamic organizations and the states that support them in an intelligent manner at all. It has always been known that the state of Saudi Arabia has been right behind the rise of Islamist fundamentalism with the blessing of the United States. Turkey is finally emerging to be another such supporter and irrespective of how much Erdogan rejects the Russian accusations regarding his illegal oil trade with Daesh [IS/ISIL], the satellite photos are here for all to see and people are not stupid," Kadi told Sputnik. "Apart from a few outcries from ultra-right wing European politicians, the Europeans have not yet taken any serious steps of preventing repeats of the Paris attacks, and if they continue to opt to play with fire, they will have to be prepared for the fruit of their action," the expert warned. 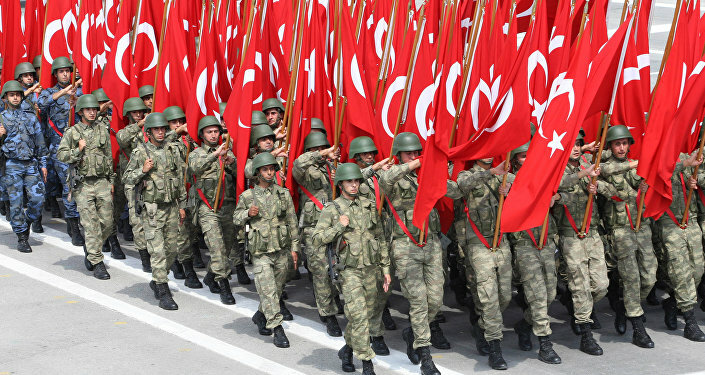 What is Erdogan's Game in Syria and Iraq?